Malaysia comprises two regions separated by the South China Sea. The western section shares a border with Thailand whilst the eastern section is found on the island of Borneo. It has a beautiful natural scenery of dense forests and pristine beaches, whereas cities like Kuala Lumpur are home to colossal skyscrapers and modern shopping centres. Malaysia is home to approximately 20% of the world’s animal species. If visiting Sepilok, be sure to visit the Orangutan Rehabilitation Centre, which has around 60-80 living there. You can feed them or simply explore the fascinating sanctuary along the walking trails. 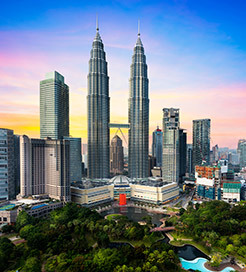 Arguably the country’s most iconic structures are the Petronas Towers in the capital and financial hub, Kuala Lumpur. They reach a staggering 452m and appear even more impressive when illuminated at night. You can book a guided tour up the 88 floors with sublime views at the top. Like most South-East-Asian countries, cuisine plays a huge part in Malay culture. Beef rendang, a rich and fragrant curry, is one of the most popular dishes. Another local favourite is boiled crab with a tangy spicy sauce. Cendol is a curious but delicious dessert of shaved ice, sugar, coconut milk, green jelly noodles and kidney beans. George Town on the island of Penang is arguably the gastronomic capital, where you can feast on local fruit, fresh seafood and Malay classics. It offers more than just great food though, it boasts brilliant street art and a number of colonial buildings, most notably the ‘Blue Mansion’. You can book guided tours around this 1880s structure, which features stunning floor tiles and traditional Chinese architecture. There is a ferry crossing which departs from Changi in eastern Singapore and docks in Tanjung Belungkor in the western region of Malaysia. There are a couple sailings every day which last around half an hour. For more information, please visit our Ferries from Singapore to Malaysia page.